Love, Mrs. Mommy: Screen Helps You Take Back Control Of Your Kids Electronics With One Simple App! Screen Helps You Take Back Control Of Your Kids Electronics With One Simple App! Tired of your kiddos spending wayyyy too much time on their phones and with other electronics? Then I have the perfect solution for you, and probably your friends too! It’s called Screen and it’s going to turn you into the Good Cop again! It gets old having to constantly remind your child(ren) to put down their phone… or to put down the gaming controller. Thanks to Screen, you can manage the amount of time your kids spend on all their electronics with one simple-to-use app. Connect your TV, gaming system and even your streaming devices and it doesn’t even matter if they are on wifi! Screen is a mobile app that can turn off all connected electronic devices, as well as show how and where devices are being used. Genius!! Now you don’t have to worry if your kids are using their phones in school, or while they are in their room and supposed to be studying. Now the eyes on the back of our heads can extend all the way across town (and beyond), as Screen will be able to tell us what our child(ren) are doing and for how long they have been using their devices! Plus, if you have concerns on how they are using their time on their phones, etc… you can use Screen to see at any given moment what your kids are doing. That’s right! You can see a screen shot of the PC, Chromebook, and even the Android device anytime you want! Parents can set times during which devices can be used, and when they should not. For example, you can set up a laptop to be available for homework from 6:30pm-8:00pm and if they need additional time to complete their assignment, you can add it to their device so it won’t shut off. Only want your child(ren) to use their gaming console for an hour, before its time to eat dinner together as a family? Just schedule the time on the app that the gaming console can be on… and then when time’s up… it will turn off for you! Now, you don’t have to hound them to put down the controller and hear them say… “just one more minute”… which we all know really means about thirty! Screen offers another feature that made me go “ohhh, that’s another great idea!” It’s their “shake” option and how it works is that all connected devices can be turned off with a simple shake of the main device! So now if your kids are getting loud or rowdy while playing on their Playstation or Xbox and they don’t want to settle down after you ask them too (for what seems like more than a handful of times), no worries! Shake your phone and voila, it will turn off! I really like how Screen can grow with your family and be tailored to fit each child’s needs. As your child grows, and the devices they are interested in (and/or need) change, you can make the necessary adjustments. It’s nice that Screen isn’t telling our kids that they can’t use their electronics, they are just reminding them that there’s more important things in life… and that’s spending time with their loved ones. With all the amazing electronics that are available to all of us, every day, it’s hard not to get caught up in it all. This way, with Screen, you don’t have to worry about how much time your kids are on their devices and hey, I don’t think it would be such a bad idea if us parents were to use it too! We all could use a little reminder to put down our phones once in a while! Buy It: You can purchase Screen on their website. 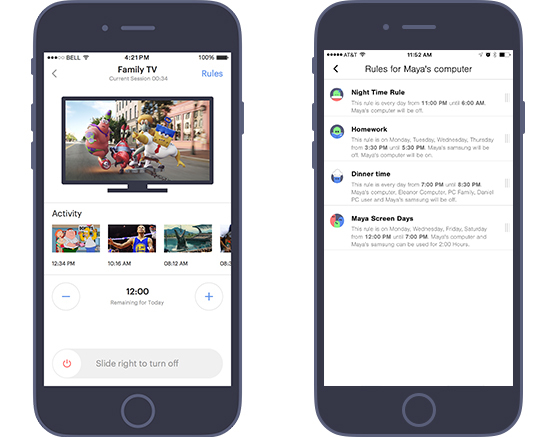 You will receive a Parents app for iPhone or Android, unlimited apps for kids’ devices and set top box for up to 3 TV connected devices for a now discounted price of $99! A $60 savings! This sounds great! I would've loved for this to be available for my parents because my brothers were always into things and all kinds of drama. I don't have enough smart devices to do this I think. Thank you for sharing. I will have to show this to my son. He has 2 young boys. Our boys would hate this app but I think I would love it! As my kids are more involved with electronics, I am looking for ways to keep them safe. WOW! Thanks so much for sharing, this sounds pretty interesting, Its nice to know they have something like this so I can make sure that they are being safe. This is so important to have! This is a good way for enforcement with my kids. Wow!! This is so cool and so convenient!! This is a wonderful app ~ my youngest sister is always complaining about her son always being on his game system & no matter how much she yells at him, he's totally tuned her out & doesn't hear her. And with this app there are so many other wonderful ways of keeping up with your kid & what they are doing. Love it! Cool !!! Disney came out with a box like that you control from an app , but I am thinking I like the sounds of this better ! Thank you for the heads up !!! Thanks for sharing. Sounds good. Thank you for the information on a little more control. Sometimes it gets quite hard, and this post will come in handy. My kids are grown and so is a few of our grandkids! I know kids will be kids, but I do hope that they were raised with some common sense & know better! I always talk to the younger ones about stranger danger & to always ask a parent if it is safe! OK SCREEN is going on my list to tell my kids!